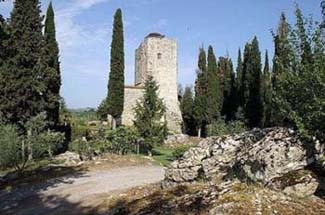 Documentation of Castello di Tornano’s origins dates back to the 11th century. The castle’s first owner was Guamellotto Mezzolombardi, who is noteworthy for his battles with Frederick the Red. You’ll definitely need a car to take full advantage of your visit here; you’re six km away from the nearest village. However, if you’re active, there’s a lot to do on the property . On hot summer days the swimming pool, which is cleverly built into the castle moat, is a perfect place to cool off, or try the open-air Jacuzzi, found on the former rooftop lookout. Rates include taxes, service, and breakfast. The castle is about 25 km north of Siena. Gaiole has a bus stop; the nearest train station is 21 km away in Montevarchi. In a peaceful, secluded location in Chianti’s wooded hills, surrounded by vineyards and olive groves, the Castello di Tornano is a wonderful Tuscan castle. In fact, it is even protected by the Ministry of Fine Arts. Cozy and romantic guest rooms are either in the main house or tower, and each bears the name of either a famous couple-in-love (such as Lancelot and Guinevere and Romeo and Juliet) or a great woman of the past (try Catherine de Medici and Lucrezia Borgia). Rooms are richly furnished with brocaded fabrics, wrought-iron and canopied beds with fabric flounces overhead. The tower suites are the most romantic of all. Narrow, winding steps lead up to the Monaca di Monza suite, noted for the views of the surrounding countryside through its eight windows. Self-catering apartments installed in a former farmhouse outside the main building are an excellent choice for those with children. They are more simply furnished and have equipped kitchens and terraces for outdoor sitting. The castle produces its own wine.